The garage sale season kicked into high gear this past weekend! After a long winter of thrift store shopping only, I was ready to finally get outside and spend some dough. I mapped out six homes to hit. Unfortunately of the six sales, four were not really worth my time and effort. But one sale turned out to be a homerun. I arrived at the house early and found the seller had a simple pricing strategy. Nearly every item she tagged was one dollar! I walked away with some good stuff, including a dollar box containing some pricey computer DJ mixing gear. I intend to separate the the gear into three different auction lots. I am pretty confident this particular dollar find will net me at least one hundred buckaroos after all is said and done. That's a pretty good start to the season! 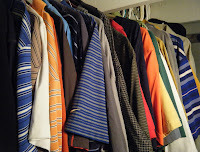 Speaking of selling, I've commenced my seasonal listing of golf shirts. The golf shirt season is as anticipated as the swallows returning to Capistrano! There are two important events that signal this money making season-warm weather and the playing of the first big golf tournament of the year -The Masters. These two opening events serve as a starting bell for most golfers to get out and play. Likewise, these duffers will also buy some new shirts to start the season off right. (I've played some golf and believe me, if you can't play well, you can at least look like you do by wearing a nice shirt!) Once the golf shirt season kicks off in April, it reaches a fevered crescendo in June when the US Open is played. This year, the Open will be at the prestigious Merion Country Club located outside of Philadelphia. I actually found two Merion shirts with the famous Merion CC basket pin stitched on the upper chest. These shirts will be perfectly timed for auction right when players like Tiger Woods are teeing off at the Open! awaiting the start of the golf season. 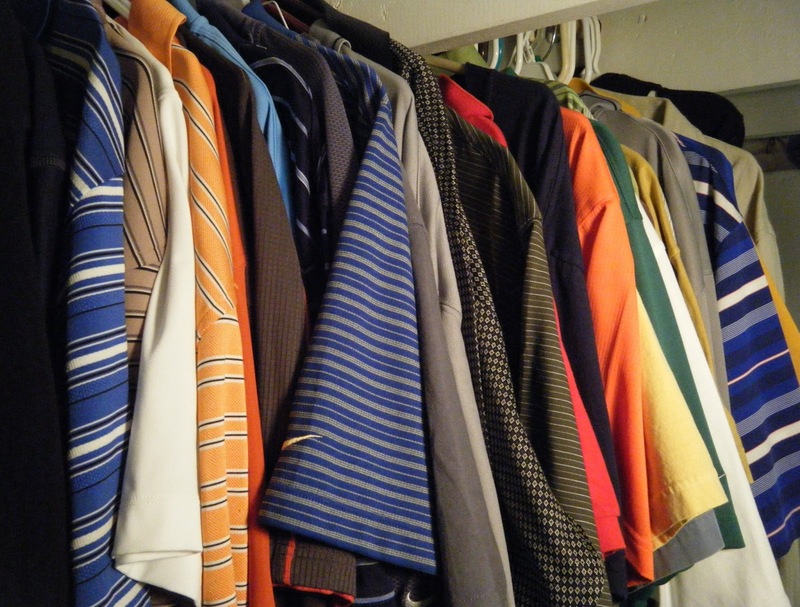 I have to admit that as my inventory grew over the winter months, I would often stand back with pride and admire all the shirts neatly lined up in a row. I felt like a lumberjack after he chopped and stacked a nice cord of firewood in preparation for the season! Only instead of a cord of wood, I have a cord of golf shirts. The hard work accumulating this inventory should be well worth it. I wouldn't be surprised if the shirts collectively earn me close to a thousand dollars once they're all sold! That's beats a pile of firewood any day! I've recently noticed some other bloggers singing the praises of several brands not cited here, including Adidas and Callaway. I have to tell you that unless you got the shirt for free, or it's new with tags attached, those other brands will not make you any dough. Best to leave them on the Goodwill rack! Sure, you may get a sale, but typically we're talking in the ten dollar range. When you back out the $4 dollars you paid for the shirt, your eBay and Paypal fees the profit might come in at around 4 dollars. Puleeze....not worth the effort! Stick to the big dogs that I cite and you should do well. When it comes to selling golf shirts, I've had the most success with Nike Dri-Fit and Under Armour HeatGear brands. Nike Dri-Fit is very popular and will always make you money. However the Nike "Tiger Woods" line of shirts is a step above standard Dri-Fit, fetching you even higher bids. Under Amour shirts are very popular too, particularly their "HeatGear" line. For example, recently I bought an Under Armour HeatGear golf shirt for $4 bucks at Goodwill and flipped it for $30 dollars. Another "can't lose" brand is "The Masters" line of golf shirts. These shirts have the famous Masters Logo on the upper chest and always generate lots of bidding action. The one seen here was also snagged at Goodwill for $4 bucks. I sold it using an eBay auction for $30 dollars-a typical closing price for this line of shirts. If you find any of these shirts brand new with tags attached it's your lucky day! You can tack on at least another five to ten dollars on the final selling price. I've had great luck with anything bearing the Masters logo (mugs, hats, bears, towels, etc). I even sold an old used golf towel with someone's name written in sharpie on the front for $30! Thanks so much for your blog-I've had some sweet sales on your recommendations! Elizabeth-Thanks for reminding me...your absolutely right! I bought a Master's (Or the Open, can't remember which) gallery chair a few years back. Paid a buck and sold it for around $50. As I said below-golfers are serious collectors, so making money with them isn't limited to just shirts. The peripheral golf stuff is worth a whole other blog discussion! I am glad you've made some dough on my tip & thanks for liking the blog....Dude! The US Open at Merion is what me started selling on ebay- had a pin from my grandfather from the 1971 Open when he volunteered and I sold it on ebay for $94- in Novemeber. As per golf shirts- only sold one but did ok- always on the look out for the next! The garage sale season is a little slow out my way. Are you near Philly? I am in the western burbs! I was not sure since I've seen Phillies gear in a post and this post with the nod to Merion! Holly-That's pretty cool that your grandfather got you interested. Nice score on his 1971 Merion pin. I am near Philly, but on the "Jersey side"as Bruce would say. In fact, found a LPGA "quiet" paddle for an LPGA Women's tourney played at Seaview CC outside of Atlantic City a few years ago. Payed a 50 cents and sold it for $40. Your pin...my paddle...proves that golfers are serious collectors! Thanks for more info on what to look for at the sales this year! I have bought Ralph Lauren Polos and sold them on Ebay. Usually get $10-$15 for them...not a ton but it helps. I will keep on the lookout now for the brands you mentioned! Thanks! Pam-Not bad, I'll take $10-15 on a shirt any day! I'd imagine you'd get even more if you're lucky enough to find a Polo shirt with tags attached. Either way, good luck with the golf shirt hunt and thanks for writing in...Dude! Susie Q - It's funny, I rarely see a Nicklaus shirt out my way. Maybe it's unique to the Ohio area? Sounds like you have a "honey hole" when it comes to finding shirts. I will update everyone after I clear out all my inventory. Good luck selling and thanks for writing in....Dude! I think for $1.25 you almost can't go wrong. But looking up Columbia Omni-Shade Golf shirts, they don't seem to be big sellers. Used ones sell in the range of $10 to $17 dollars. You could leave it up there for BIN and hope someone bites on it. Your other option is to combine it with another same-size golf shirt, even if they are two different brands. I like to call them "two for one bid". The Columbia could be a little something extra that gets your buyers to take the leap and buy. Like I said, for 5 quarters you can't really go wrong! Let me know how you do.....Dude! Dude, thanks for the info. I am just starting to sell golf shirts and am hoping to learn what to look for. I recently picked up a Tiger Woods 2004 Whistling Straits PGA Championship shirt. Are all Tiger Woods shirts made by Nike? I don't see anything Nike on the label. Do you have a suggestion for a BIN price? Thanks in advance. Marisa-Sorry I didn't see this comment sooner and get back to you. You may have sold the Tiger Woods shirt by now, but I would sell it via auction. There are tons of Tiger fans out there who would probably bid that shirt way up. I found a shirt at the salvation army today that had Tiger Woods on the inside label and the word Rolex on the upper left chest in BIG words. There were two of them. Do you think they are worth anything? I think Tiger has lost some of his cache, as they say. Also, the Rolex on the chest may be a turn-off to some golfers. (I've never seen a shirt like that, probably a promotion of some type.) However, if they are the same size, you can sell them as a pair. Two for one always attracts bidders. But they have to be in near-perfect condition (and cheap) to take a chance on them. Hope that helps, thanks for the question.